“Chi si fa pecorella, i lupi la mangiano”. Make yourself a sheep and the wolves will eat you. 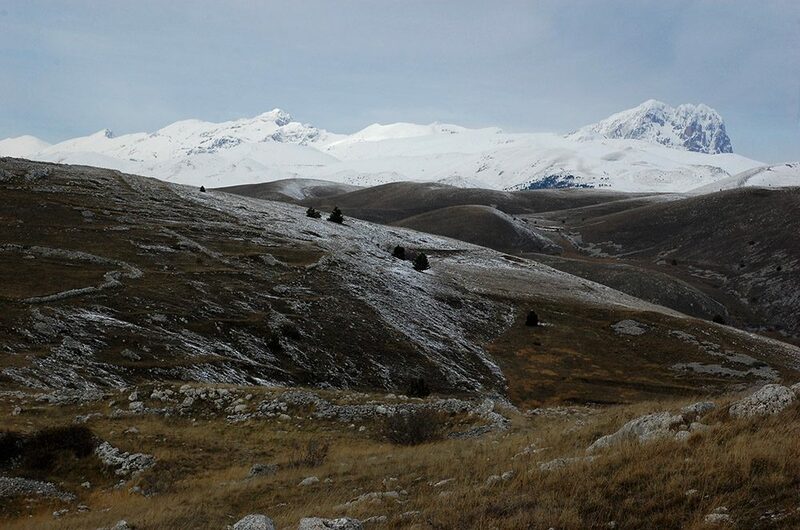 People have been sheltering and living ‘at the top’ in Calascio for 45,000 years. Its rooftop views over Abruzzo’s Campo Imperatore, the Valle del Tirino basin and rich Navelli Plain magically banish brain fog, whilst the ability to withstand its intense bi-annual weather conditions instills self-confidence with a belief you can silently conquer. Such strength of character empowered local townsfolk to manage invaders throughout the centuries, rebel against the tribute-seeking Benedictines from the Monte Cassino Abbey and with 2 neighbouring towns create the Barony of Carapelle in 1300. Calascio despite its 127 inhabitants is now almost silent, less the season’s wind. If you are lucky the distant tinkle of sheep bells from its surrounding former summer mountain pastures called ‘defensa’ may accompany the ‘urban’ part of your ramble. It seems almost unimaginable that just 500 years ago the town housed some 1491 inhabitants and the acoustic melody from sheep bells was more like sitting centre stage at a chill out music festival. 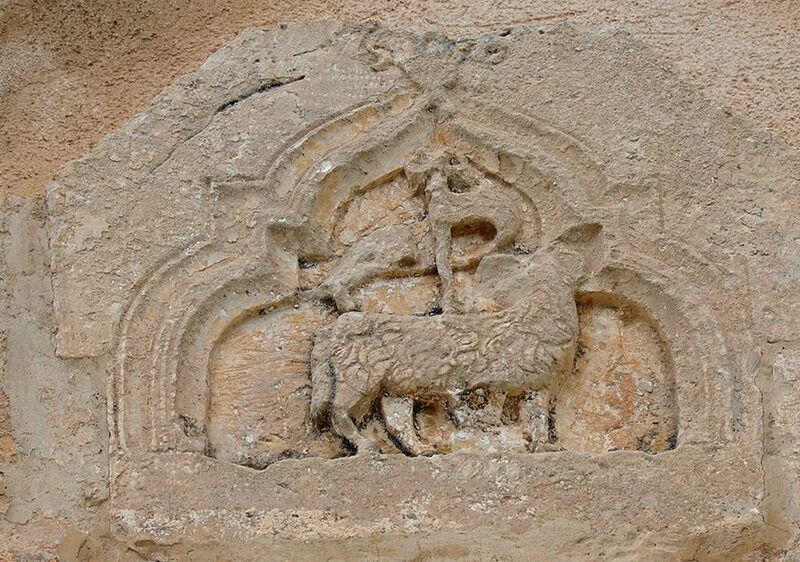 Abruzzo’s population of 300,000 at the time supported 3 million sheep, tended to by 30,000 shepherds who paid taxes to use the local trails (tratturale) that crisscross the region’s mountain plains. Income from these trail taxes helped the Barony own 90,000 sheep in its heyday. By the time of the early 18th century, the local wool based economy was beginning its slow decline and La Rocca, the defensive fortress listed in National Geographic’s Top 10 World Castles overlooking the town was not rebuilt following a devastating earthquake. 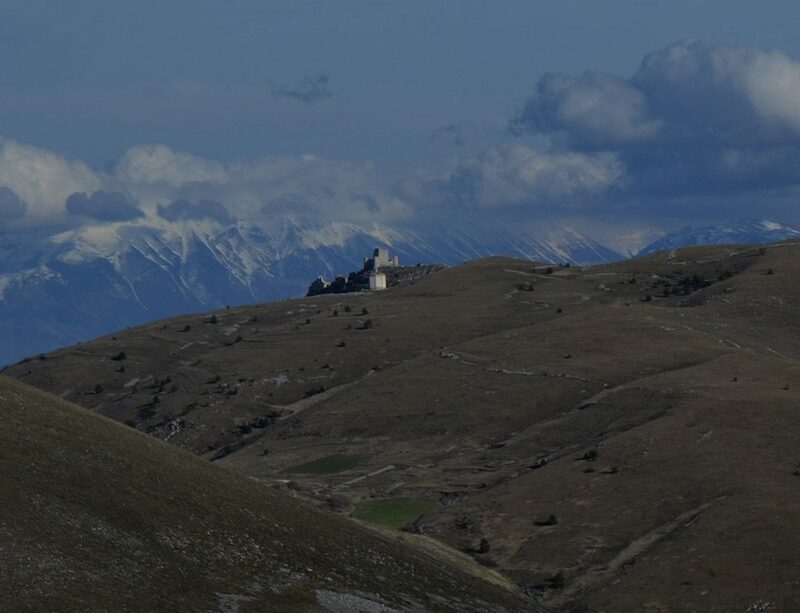 From the realms of Calascio’s town fable you uncover fame, fortune, brilliant cheese and a hint of the relationship the community had with surrounding karst ‘Gran Sasso’ limestone, which ultimately led to their mass migration. The rock that provided the once sparkling case-mura style housing, towers, ornately embellished palazzos and the basis of street names like Via di Mezzo la Terra or Middle Earth Street, sucked precious water down into its lower depths. The town is dry, the nearest spring 20 km away and first fed the town’s newly built fountain in 1911. Man-made lakes were created in neighbouring towns where the less well-off walked up and down the ridge that makes up Calascio, they were adequate as long as it rained. If you were rich your family would have a well in-house to collect rainwater and snow. Toil, especially agricultural toil requires strength which the Calascini have had in plenty, but thirst can drive you crazy from what it removes from a life, leading you to abandon everything you regard as home as we see too frequently today worldwide. “In the days when fairies spun beneath the oaks and when they returned to their secret houses, they wove a cloth so supple, on a loom with combs of gold and heddles of silver, King Marrone lived at Rocca Calascio. 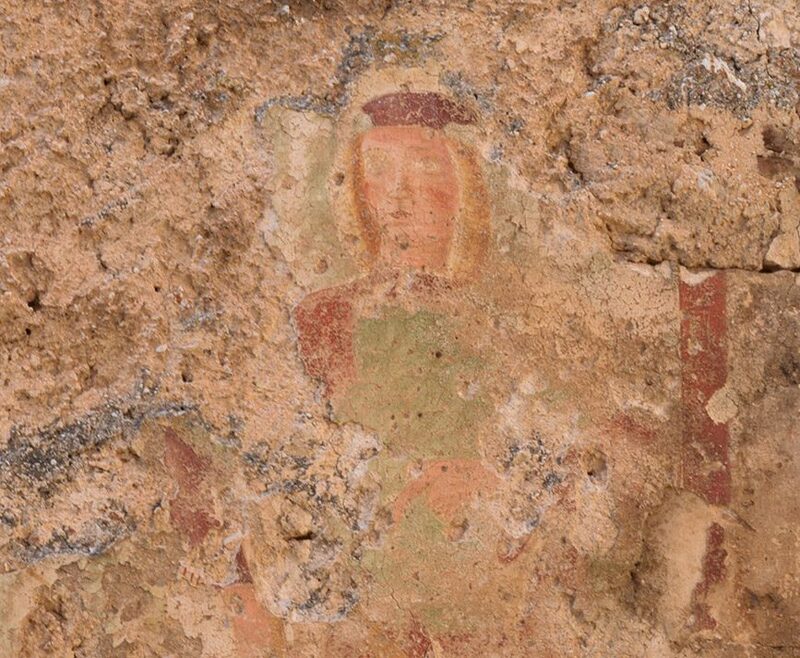 He owned 36 castles in Capitanata and 100 towers of the Barony of Carapelle. He was the owner of the most beautiful flock of sheep that had ever been seen in these parts: sheep, rams, lambs, formed more than 100 herds at the head of which were giants “massari” taller than three rifle-lengths, followed by guaglioni with black eyes and bony horns across their shoulders, full of oil and salt. The cheese of King Marrone was the most flavourful of all the farms of the mountains, and the wool of his sheep was the whitest and softest, so much so that, when market time came around, merchants came from Naples to come and buy his cheese rounds and his ricotta (cheese). Every year, the King of Portugal would send his three sons to La Rocca, with a retinue of pages and knights, to attend to the May shearing, which was the most precious and the only one worthy of filling the cushions, the quilts, and the mattresses of the royal bed. At San Marco, however, the King of Crowns was the owner. He too had towers and castle, soldiers and encampments, farms and villages, sheep and mules, but he enjoyed none of his riches because he was envious of the fortune of King Marrone. One day the King of Crowns found an excuse to begin an altercation, and over a question of pastures and precedence, he began an unhappy war against King Marrone with violent battles and long sieges that lasted for years and years. King Marrone resisted, closed within his castle for more than ten years, during which he consumed all of the riches within his storerooms. First he ate the ricottas, then the cheese, then even the horses and mules, and finally the sheep and the lambs. By now there was absolutely nothing left for him to eat. In the granary, the wheat was gone; the mills had nothing left to grind and the wells were dry, also because it hadn’t rained for many months, so that even the grass had dried up in the fields. The soldiers were growing old and all had long white beards. Then King Marrone had an idea. He gathered together all the people of La Rocca. He had them milk the remaining sheep, but there was still too little milk. So he called together all women who were nursing babies and he begged them to express the milk from their breasts into the kettle. The cheese-maker, for his part, went to work and succeeded in making 12 rounds of cheese, huge and round, such as were usually only seen in better times. King Marrone called all his soldiers to the highest tower and commanded them to roll the cheese rounds into the valley, while the old women and children made a great show of parading up and down the walkways as if they were having a festival. Upon seeing this, the King of Crowns couldn’t believe his own eyes. Even his people were beginning to get low on supplies and instead La Rocca had enough foodstuffs and resources that the people could throw cheese away into the valley! He thought that King Marrone must be invincible, and since his soldiers were now tired and at the end of their strength, he withdrew his siege and sent ambassadors to negotiate peace. 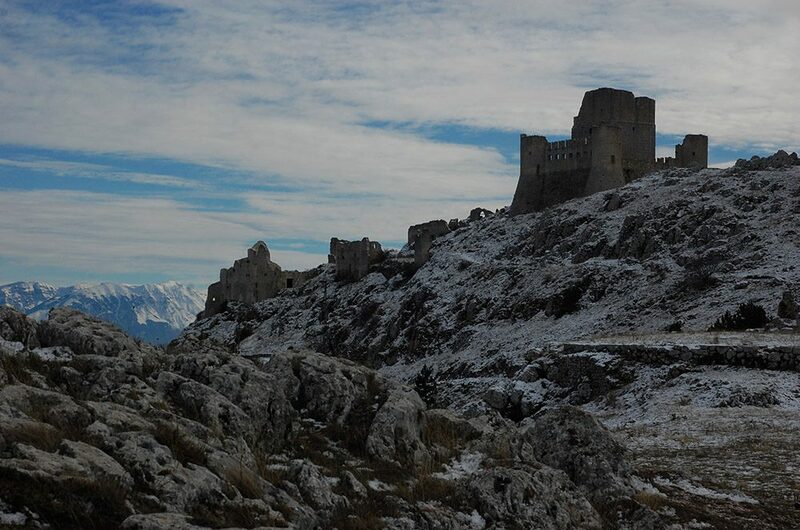 The magic of Calascio, a town 1200 meters in altitude, is the capacity to transform the past into present and future. With grateful thanks to Paul Zelus to providing such full answers to all my questions, Franca Fulgenzi who produced the original Italian text of the reproduced ‘fable’ as part of an article for the glorious D’Abruzzo Magazine, and to Jackie Silvestri Capurro, who translated it into English for the incredibly informative Calascio website; D’Abruzzo’s original print publication of the article is as follows: “Estratto del n. 30 Estate 1995 di D’Abruzzo. Periodico trimestrale pubblicato da Menabo s.r.l. Reg. Trib. Di Chieti n. 8 dell’ 11/11/1986 Redazione: P.zza Duca d’Aosta, 50 – 65121 Pescara tel. 085/4212238, fax 085/4214210”. [I.e., extracted from D’Abruzzo magazine (Summer 1995), Volume #30. Published in Pescara, (AQ), Italy, by Menabo s.r.l. Ortona]. Sam, I hope all is well. Love reading your blogs on your sites and hope to see you soon. Thanks Gary, this was one was so much fun collaborating on, hopefully a few more like this. Take care and see you soon! Thank you for discovering such interesting places. When in Abruzzo next time we’ll go there for sure. Thx Mikhail, hopefully we’ll be able to add some of your tips in too! Wonderful collaborative effort. We need more of this. Thanks, Sam.